Beaverbrook Montessori School, established in 2004, offers a range of Montessori-based child care and learning services for your children. Our main objective is to provide as wide a field of learning as possible in a safe and caring environment. 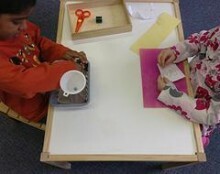 The Montessori approach aims to nurture and develop a child's innate desire and ability to learn. By pursuing individual interests in a loving and orderly environment, each child can work freely with stimulating and self-correcting materials. Our students interact in a community atmosphere, learning to respect and care for one another. Older children are encouraged to set the example and help the younger ones, which in turn encourages a sense of pride and independence. We strive to develop responsible, peaceful and nurturing young minds with confidence, self-esteem & respect for others. Our graduates are self-motivated, intellectually curious individuals who love to learn. Beaverbrook Montessori strives to meet the individual need of every child, providing an enriched Montessori curriculum and environment in English with weekly French instruction.